So, after having this blog for a year, posting a few things, and writing several things that didn’t seem right, so they didn’t get posted – I have FINALLY been inspired! Praise be to God! Seriously, if I didn’t know that it was God’s will for me to put this blog out there for His Glory and for the good of the Kingdom, I would have shut it down months ago. Even through my discouragement and dryness, as it related to writing posts, I knew that I needed to keep praying for clarity, and discern what He wanted me to do. Initially, I think I knew why I wanted to start this blog all along. Or I guess I should say, I had some understanding of why the Lord put it on my heart to start this blog. It is because I LOVE being Catholic! I absolutely love it and I want to share that with others. In sharing what I adore about our magnificent Catholic Church, I hope to help others – and also spread joy! 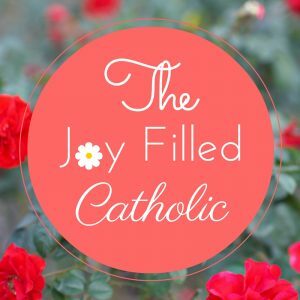 That is why I named this blog The Joy Filled Catholic. Because that is what I am! In the midst of all the negativity, hate, hurting, and sin that exists in our perishing world – through my faith, the Word of God, Holy Mother Church, and the Holy Spirit working within me, I have an unshakable sense of peace and joy. Something that I NEVER had in my life before I started trying to understand why I am a Catholic. …and on and on. I never had a clear answer though. So I went searching. I decided that if my husband and I are going to raise our kids Catholic and invest in Catholic education, I should probably know the WHY. Why choose Catholicism over being Lutheran, Presbyterian, Jewish, Mormon, Jehovah’s Witness, Scientologist, etc. It seems like all religious denominations believe they have the answers, or they have the truth. Even non-denominational churches feel like they have it right. The truth is, there is only one true church – and that is the Catholic Church. Jesus says so himself. Don’t get me wrong, I adore our separated brethren and have a lot of respect for the good that they do in the world. Why do I love them? Because they love Jesus and they are seeking to do right in the eyes of the Lord. They are sheep that are still close to the Shepard but have veered off to a nearby path. They have some of the truth, some more than others, but they are not in full communion with Christ’s church. They have been led astray by false teachings or desire to find a church where they can decide which teachings to believe and which ones seem a little too hard. Enter through the narrow gate; for the gate is wide and the way is easy, that leads to destruction, and those who enter by it are many. For the gate is narrow and the way is hard, that leads to life, and those who find it are few. Do you think that I have come to give peace on earth? No, I tell you, but rather division; for henceforth in one house there will be five divided. Three against two and two against three; they will be divided, father against son and son against father, mother against daughter and daughter against her mother, mother-in-law against her daughter-in-law and daughter-in-law against her mother-in law. No, my friends, it is not easy to be a Catholic – but it is right. It is true. The Catholic Church is the only church that can be traced back all the way to Christ Himself. In the years following Christ’s death and resurrection, Christianity spread like wildfire. This was at a time when travel was difficult and perilous. There was no social media, television, or radio. Against ALL odds Christianity thrived! The Catholic Church has seen the rise and fall of many an empire and yet She still holds firm. My brother’s and sisters, I have so many things to share with you! I invite you to journey with me as we explore all the beauty and truth of Catholic Church. My hope and my prayer is that I can provide some information that will peek someone’s interest to go on their own exploration of faith to learn about the Catholic Church – even if they are just wanting to do so to prove the Church wrong. I know that anyone who fervently and earnestly seeks to understand the Church’s teachings, will, at the very least gain a new respect for the faith. Amen!! As a practicing Catholic who reverted to the faith after being away, your entry beautifully expresses how I also feel about faith and Christ’s universal Church. Thank you for reading and taking time to comment. I am also a revert. I believe that my experience of exploring other faiths, then returning home, has given me a much greater appreciation for all that the Catholic Church is and teaches. Blessings to you!